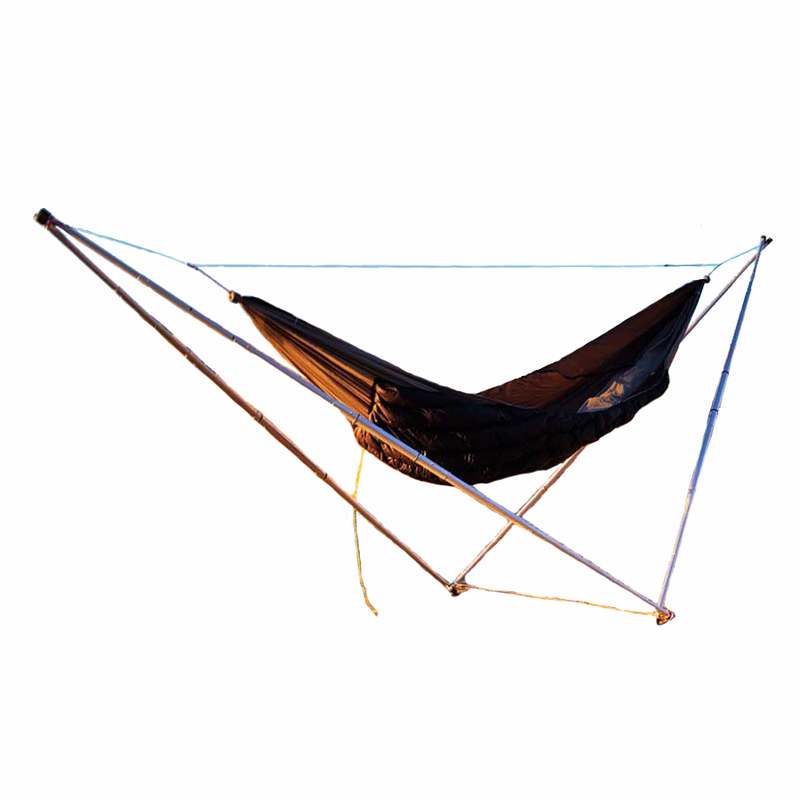 Tensa4 is an innovative, go-anywhere hammock stand. 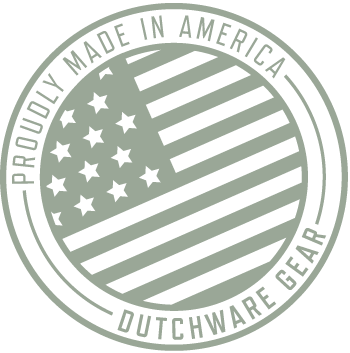 It provides peace of mind in traveling with a hammock, indoors or out. 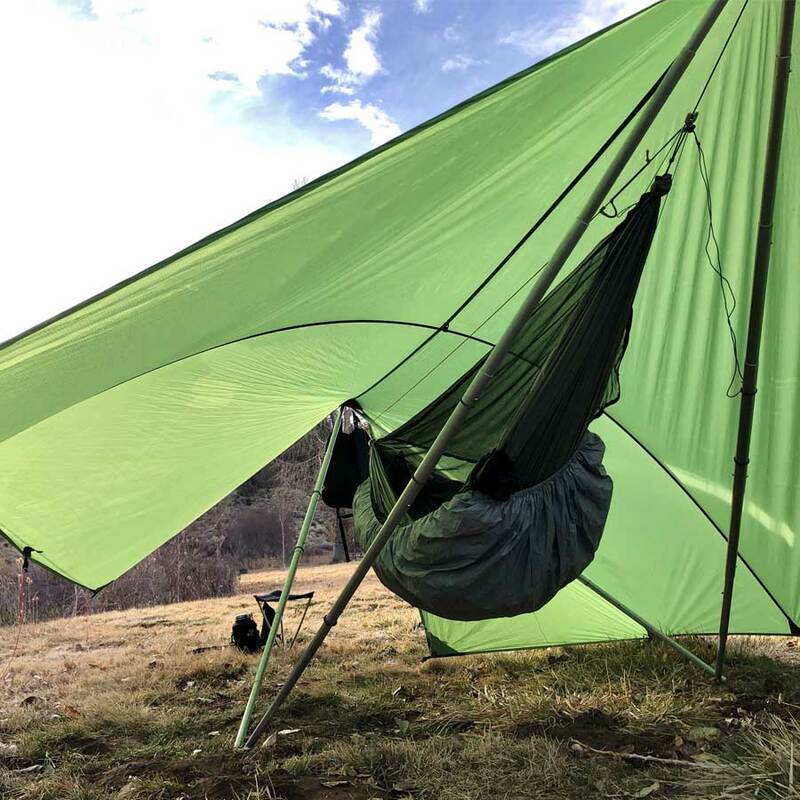 With by far the smallest footprint, smallest packed size, and lowest weight of any stand so capable, Tensa4 supports up to 400lbs in hammocks up to 12′ long. It weighs 13 pounds (10 if you leave inessential parts home), packs to 20″ long and about 5″ around, easy to carry on a bike, aboard a plane, or a couple miles up the trail. December 2018: we are transitioning the style of our connections and lines as described in this video, not yet reflected in other documentation. It will accommodate any gathered-end hammock on the market, up to 12′ long, as well as some bridge (Warbonnet Ridgerunner) and transverse (Amok Draumr) hammocks. 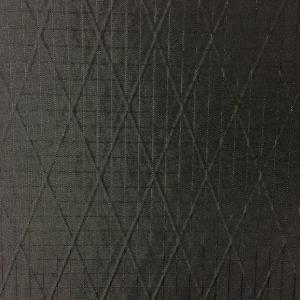 Unlike many portable hammock stands, ours supports full-size hammocks with a deep 30° sag for comfortable sleeping on the diagonal, while still offering good seat height. The stand works fine with tarps for complete shelter. 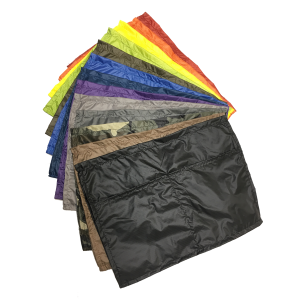 11′ tarps are ideal; longer require modest ingenuity to tension properly, with a tarp extension kit forthcoming to provide more headroom and length. 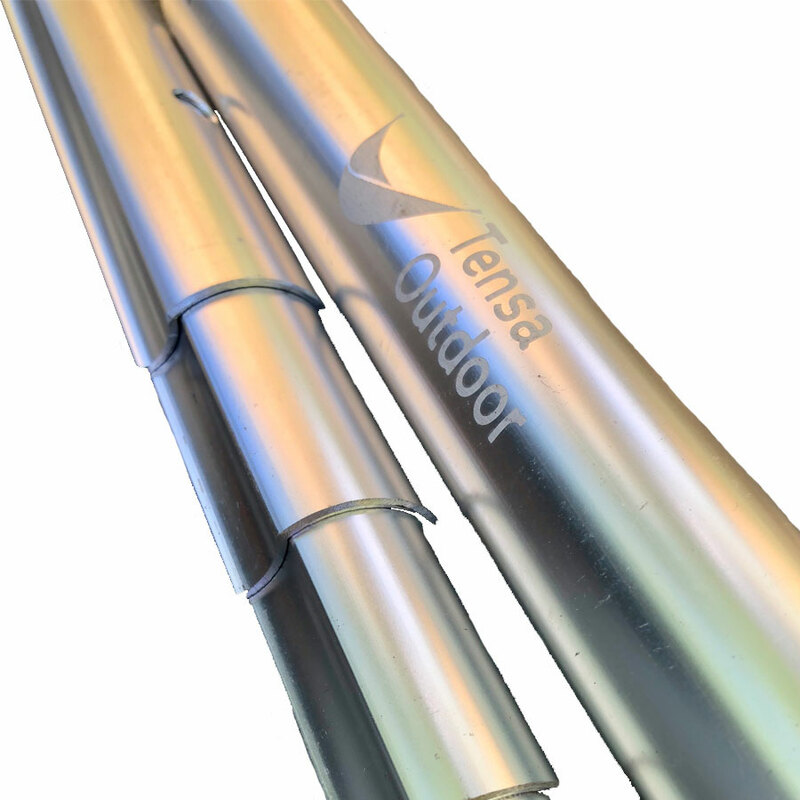 The product is four poles made of 28 segments of custom-made telescopic anodized aluminum tubing, two anchors, four pole connectors, one guyline, one ridgeline, one baseline, a head tether, and a bag. I have owned a Tensa4 stand for about 3 months now. In my opinion, this is a game changer for portable hammock stands, especially for motorcycle/bicycle camping. The stand is very stable, and collapses down to a very manageable bag, that easily fits on my motorcycle. One of the most important aspects of this stand, is that I don’t have to worry any longer about whether I will be able to find a place to hang my hammock at the end of a long day of traveling. What keeps it from tipping to one end or the other? Would love to see a design to convert part of poles in to trekking poles. Then could possibly cut carry weight in Half for back packing.😁 Definitely getting one of these for my bike. How long is each pole when fully assembled? have you tried using a bridge hammock with this stand? I think it will hit the poles, but to see. I have a wb ridge runner. It will accommodate the warbonnet ridgerunner. We here at dutchware have not tried it however tensa has. This is a great stand – looking forward to using it in the wild. I see in the photo that the hammock is attached to the stands ridgeline – I would love to see a close-up photo of this as it looks like and interesting solution. This hammock stand is very nice! It’s much more stable than you would think, and hanging a tarp over it is a breeze. The initial setup requires a bit of trial and tinkering, but once you get it where you like it, the setup time becomes pretty quick and easy. I don’t have suitable trees for hanging in my backyard, so this stand affords the opportunity to test out gear before camping miles away from home. We do not have indoor use test results and I would advise you to go directly to tensa and inquire with them. 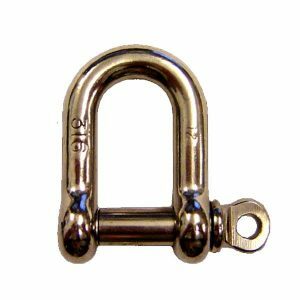 Will this stand work with the double Dutch setup? Thank you. No it will not however the Tato gear stand will work for the double hang.